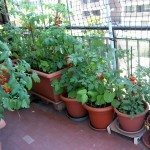 Controlling rose fuller beetle in the garden is a good idea if you expect to grow healthy roses, along with other plants. 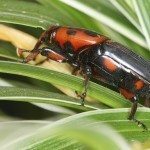 Let’s learn more about this garden pest and how to prevent or treat rose beetle damage. The fuller rose beetle adults are brown and do not fly. 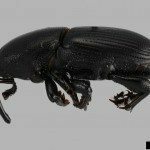 They have a snout that resembles other beetles in a group known as snout beetles. Viewing them from the top, their head and bulging eyes are different from other snout beetles, as the snout is less sharply pointed to the ground than that of the vegetable weevils. The adult females come out of the ground year round but are usually the heaviest from July through October. There are only females; there are no males. The female beetles lay eggs and, like other unwanted garden beetles, the larvae that come from the eggs drop to the ground and feed on the roots of the host plant for 6 to 8 months – after which they pupate and come out of the ground as adults the following year. 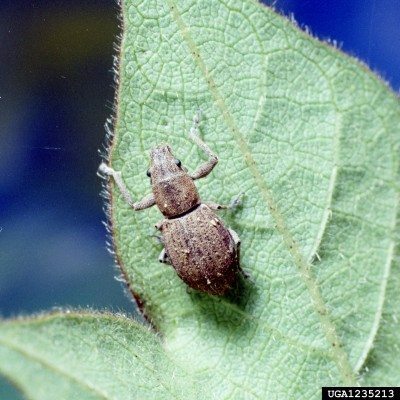 The damage done by this beetle is to the foliage of the host plant by the adults and the root system is damaged by the larvae. Death of the host rose bush is a very real possibility if not controlled. Part of figuring out the pest we have is in recognition of the damage the particular insect does. With the fuller rose beetle, the leaf damage is typically serrated (notched edges), creating a ragged appearance. Under heavy infestations, these beetles can easily consume an entire leaf, leaving only the midrib of the leaf! The younger larvae eat at the root hairs or rootlets, and the older larvae girdle the lateral roots of the host plant. Such damage to the root system will result in stunted growth since the roots are unable to effectively take up the nutrition it needs. Weakening of the root system also makes it a good candidate for fungal infections that will aid in the death of the rose. Early recognition of such a problem is priceless, making the treatment of fuller rose beetles imperative. If the host plant damage is noticed and treatment of fuller rose beetles is started early on, it should recover well, mending its own root system and growing new healthy foliage. A light presence of this beetle can be controlled by hand picking them off and dropping them into a bucket of soapy water to help break the chain of egg laying and more larvae dropping to the soil below. Chemical control is usually best done using a granular systemic insecticide, as this treatment goes after the larvae/grubs attacking the root system, as well as going on up into the host plant to go after the adult females. Such systemic treatment is only for ornamentals and only if the rose grower does not use the petals or hips later for foodstuffs. Spraying an insecticide (such as Sevin) for control of rose weevils as a last resort will usually produce good results on the adult beetles with some control of the larvae. It is recommended to try other forms of control first though, as the harsher treatments will also destroy the good bugs in our gardens. Using neem oil at 7- to 14-day intervals is thought to be a good control method for the adult beetles without the harsh after effects. As is the case with any form of pest control, noticing a problem in its earliest of stages goes a long way in gaining control by using a treatment method with the least side effects. Spending time in our gardens and truly observing our plants is healthy for them as well as for us.